On the 15th August at 9.00 am Mr. Sanwean Boonto, deputy governor of the Sports Authority of Thailand along with Mr. Wutikorn Suriyachantananont Senior Executive Vice President Toyota Motor Thailand Limited hosted a joint press conference of Esports under the name of Toyota Master CS:GO Bangkok 2018 at Samsung LED Cinema 4k Siam Paragon 6th floor. The tournament prize will be $100,000 USD which equates to more than 3 million baht. The tournament is scheduled for 23-25 November this year. Mr Sanwean Boonto announced on behalf of the Sports Authority of Thailand that it is an honour to be part of the CS:GO event which will be held at an international level. Aiming to develop and bring the Thai eSports community to an international and professional level. To pave way for Thailand to be on the forefront of eSports gaming and world class competitions in Asia. Mr Sanwean Boonto also said that he is very pleased to be a part of the project and has given support towards this eSports tournament. As this will be the biggest CS GO international eSports competition held in Thailand. Mr. Wuttikorn Suriyachantananon disclosed that. 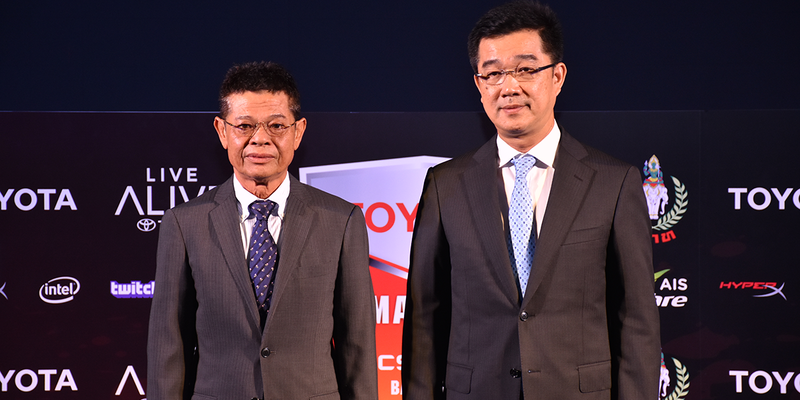 On behalf of Toyota Motor Thailand Co., Ltd. It is an honor and a pleasure to be part of the eSports CS:GO competition as eSports is currently advancing within the world and is becoming widely popular. This eSports competition will also be coming to the 2022 Asian games which will be held by China and will be held as a demonstration sport at the 2018 Asian Games in Jakarta, Indonesia. Toyota Motor Thailand Co., Ltd. sees a great opportunity to develop the potential of athletes for the eSports of Thailand to step into a global competition under Toyota Master CS:GO Bangkok 2018. The game used to compete will be Counter Strike: Global Offensive (CS:GO), which is a widely popular game around the world. It is also a game that has become a world class eSports. The competition will also be consistent with the TOYOTA LIVE ALIVE concept that supports the new generation on eSports and sports. Individuals that choose to live their life in their own way. To find and discover new values and aspects of life and to help develop a better society. Toyota is ready to support all inspirations for the coming generation. “Come out to live” being the main concept and policy which has been adopted by Toyota. Mr Natthanon Ekrangsri, Managing Director of the Check-Mate Creative House Co., Ltd. Said that the competition of Toyota Master CS:GO Bangkok 2018 is a CS:GO competition that is a great leap for eSports in Thailand. The total price pool of this tournament will be $100,000 USD and which will directly inviting 4 world class teams, currently one invited team has been announced. RENEGADES which has an international fan base is known around the eSports world. This competition will be a first in Thailand. Mr Phillip Tseng, Managing Director of Beyond Godlike Co., Ltd., said that “There will be total of 10 teams that will be coming for the Grand Finals. In which 4 teams would be directly invited 6 teams will be qualify from 6 different zones around the world through an online knockout tournament. These zones are CIS , North America, Europe, China and ASEAN. In Thailand there will be both an online competition as well as an offline event. This will make the 10 teams which will battle it out in the grand finals to come. We have also world class partners which will make this event the greatest it can be. -AIS Fiber the official internet service provider which will be providing seamless fiber optic internet connection through out the event. -HyperX the official gaming gear and equipment for the competition. Whether it is a keyboard, headset, mice and mouse pads. HyperX is also one of the top gaming gears around the world in where Pro players around the world choose as their official gaming gear. -Intel the official PC provider of the event with their latest 8th generation K-series to ensure the high-quality experience for the pro gamers. -Twitch the official live stream platform in which the main event will be live stream in 4 different languages which is Thai, Chinese, English and Russian.